An Instagram exchange between two Lucky Magazine editors made me laugh the other day. 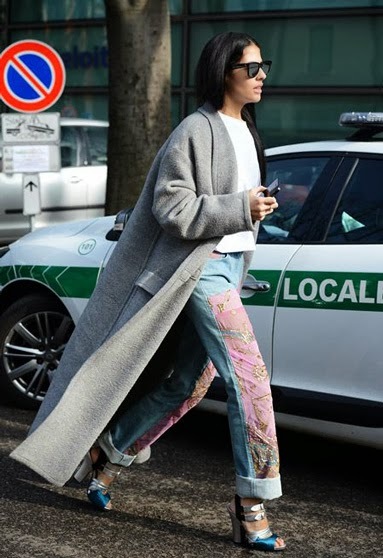 One announced to the other that she bought a pair of cropped wide leg pants from the Phillip Lim store in Los Angeles while in Milan, waiting for a runway show to start. Then concluded with: "#crosscontinentshopping." I can relate to this non-stop-shopping compulsion, as you all well know! Plus, I've been thinking about adding some cropped wide leg pants to my wardrobe. This fresh silhouette appeared everywhere on the fall runaways (I loved the ones at J.Crew and Elizabeth and James) and in and around the shows from New York to London to Paris, as seen above and below. Pictured in the last snap is Lucky's editor-in-chief Eva Chen sporting Topshop's version. My compulsive window shopping turned up these cool guys from 3.1 Phillip Lim (the Lucky editor-purchased one), Theyskens' Theory, Asos, Topshop Boutique and Joseph. do you know who makes the pair in the 1st photo..love these? thanks! Do you know who makes the black/denim(?) top with the plaid sleeves in the 6th photo from the top? Hi - Love these new pants!! Can you tell me who makes the jeans with the pink fabric on the front!~! That denim top with plaid sleeves is by Stella McCartney. I know because I have that top :) love it! I am addicted to Marlien's vision, find her combinations amazing and my imagination and my wardrobe have been nourished by her great finds. But, while I love this look, unless you have slim to non-existent hips and truly gorgeous ankles, this really travels into a no-go zone -- unless you enjoy looking like a teapot. I’d love ideas for some jeans/pants are not skinny skinny or baggier boyfriend that work for slim women with the odd curve.